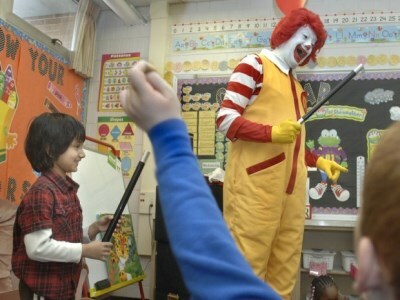 Health and Physical Education, brought to you by the delicious taste of McDonald’s. It seems strange, maybe even unethical, but the corporate brandings of big business are making a controversial entrance into our classrooms. As many schools struggle with funding, some of them have entered into agreements with corporate giants such as McDonalds, Woolworths Petrol and NAB to secure funding for major school programs. With uncertainty rising over the scale (and length) of the Government’s promised Gonski funding, it’s possible that other underfunded schools may turn to big business for cash in exchange for corporate advertising rights – and more. However, the subject has (predictably) been embroiled in fierce controversy. In 2012, the Alliance of Girls Schools drew the ire of some health experts when it invited the CEO of Jenny Craig, Amy Smith, to speak to a gathering of hundreds of teachers from the nation's top girls schools. BodyMatters eating disorders specialist Lydia Jade Turner said Smith’s presence at the gathering was inappropriate, adding: "We know that Jenny Craig is a diet and the CEO is a global player in the diet industry, which we know survives on the body dissatisfaction and drives for thinness in women." In an article published in The Conversation, some of the more complex issues that can emerge when schools and corporate branding mix were highlighted. “If children are consistently exposed to a particular brand (say, McDonald’s) in an environment where they are educated, they will make unconscious (and positive) links to that brand. If they then see the brand on television, on outdoor advertising, even the logo as they drive past the store, this connection is reinforced," the article stated. The ethical issues raised are many and varied. Consider the following, just for starters. Will corporations be able to choose children’s literature to be studied? Is there the possibility of company logos appearing on school uniforms? And will there be a growing corporate influence over canteen menus? Speaking with Alternet’s Rachel Cloues in August 2014, an unnamed teacher-librarian in San Francisco perhaps put it best. “My son will start kindergarten soon, and for the first time I feel the weight of these issues as a teacher and as a parent.